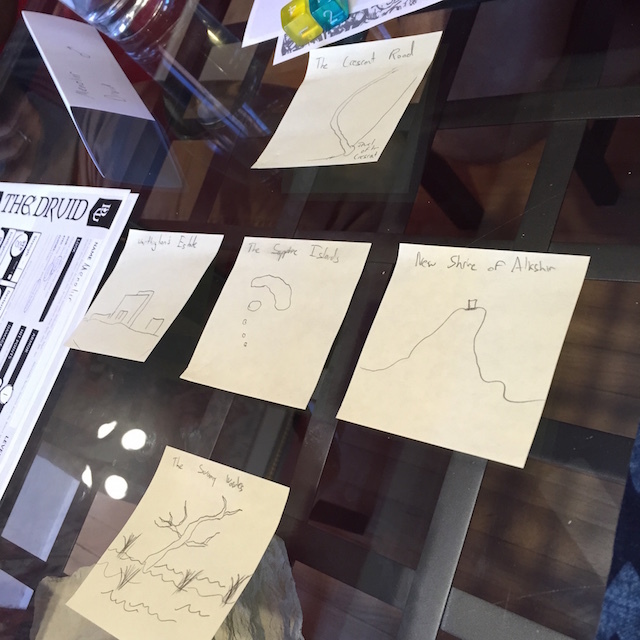 I finally got a chance to play Dungeon World on its own terms (as opposed to just reading and borrowing ideas for D&D). 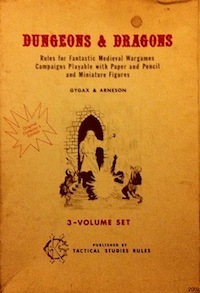 Other than myself and the GM, there were three other players, none of which had ever played a tabletop RPG before (but were familiar with the general idea and had experience with computer RPGs). In addition to general play impressions, I was also particularly interested in seeing how long and complicated the character creation process would be. My previous experiences with powered by the apocalypse games have been Apocalypse World itself (a whole session, rather complicated) and Undying (a whole session, rather complicated). Since this game was explicitly pitched as a one-shot (or maybe a two-shot), clearly character creation would have to be less extensive, so I was curious if an AW lineage game could also do a more expedited intro naturally. We had four PCs: druid, bard, paladin, and thief (that was me). As far as I know, the setting was mostly undetermined beforehand, with the exception of a few leading questions used for creating bonds and setting the stage. The main such question was a quest hook, something along the lines of: why does your character want to destroy the Chimaera-Hydra? The Paladin’s answer was that the Chimaera-Hydra had been gathering powerful holy books from many religions which were the key to some dark ritual. My (thief) answer was that the Chimaera-Hydra guarded a fabulous treasure which would allow me to get back my lover who had been tempted away by a rich man. There were lots of other leading questions that I forget right now, but it actually did not take very long. I think it was about 30 minutes. In addition to this collaborative world-building, we dynamically created the beginnings of a world map using post-its based on the setting questions. I think the GM had previously decided that the Chimaera-Hydra lair was in swampy woods (though that might also have been a result of a question that I am forgetting). The starting area was a trade route in the desert called the Crescent Road. To the south was the Sapphire Isles, which was the home of the druid PC and his order. I had stolen maps and other secrets from the druidic order to gain info about the Chimaera-Hydra, which the bard knew about but had not revealed to the druid PC. The paladin had been consulting with the druids about the theft of holy books when the thief was on the isles and at one point protected the thief (probably before meeting the druid PC, though I forget exactly how that went). The level of background ended up being just about perfect, and pretty much all the details were used in play, though I do not think we ever remembered to roll+bond. Clearly I was not interested in dealing with the druids again. We settled on going southwest through the estate, though not without the help of the thief loading the dice that we rolled to decide the direction after voting yielded an even split between southwest and southeast. The rich man turned out to be a wizard, his estate a flying castle, and his stables were filled with pegasi. My elf lover had somehow been brainwashed or something and once the wizard figured out who we were he attempted to snare us and summoned a fire medusa to kill us while we were trapped in the castle’s great hall. The combat was smooth (though starting with such high HP always feels a bit strange to me since my reference level has become OD&D’s 1d6). Some highlights include the paladin trying to force the medusa’s gaze away by physically wrestling it and accidentally partially petrifying the bard, the druid rallying the dogs in the great hall as a pack, and the elf lover being totally turned to stone. After defeating the medusa and wizard we had to carry the statue with us since we did not trust him enough to de-petrify him immediately. As a side note, the polyhedral damage dice seem unnecessary (1d6+STR would sufficiently advantage martial classes). The extra game pieces introduce complexity that will likely only be appreciated by someone that takes pleasure from D&D allusions. After the combat, the castle began to lurch sideways and lose buoyancy. (Apparently castles need live wizards to fly. Who knew?) So then we needed to decide whether we wanted to flee and save ourselves (leaving all the castle inhabitants to fend for themselves) or try to fix it. Lore Spouting by the bard (who had informal magical knowledge) revealed that there was probably some sort of magical device at top of the central tower. So we split up with the bard going after that and the rest of us heading to the stables for some pegasi to use as getaway cars. If we couldn’t fix the castle, we figured we could still fly away. We managed to figure out the required ritual, which required bleeding all over it as a sacrifice of life energy. This also resulted in the duplication of the bard’s consciousness within the castle because the flying depended upon an animating spirit. (This was probably my favorite session development.) That is where the session ended. We didn’t reach the Chimaera-Hydra, but we did end in possession of a sentient mind-linked flying castle and with my disloyal lover reclaimed (though he happened to be made of stone). Details. One aspect of play that I found somewhat surprising was how the rules facilitated archetypal thief behavior. I am not sure I find this completely positive, considering how disruptive such behavior can be in more traditional games where I tend to prefer teamwork, but I was impressed that the rules when followed had this result. For example, in addition to loading the dice to influence the group’s choice of path to the swamp, at one point when in the starting city, I was tempted to craft wolfsbane (clearly highly illegal in a settlement of wolf-people). I also got the party into trouble after trying to persuade a wolf-youth to become a druid zealot follower. I failed the roll+CHA and was chased over the rooftops by guards. Luckily they were less sanguine about an acrobatic four story drop than the thief and so we avoided a fight, but still. The thief is a trouble-maker. As I understand it, ideally Dungeon World is intended to be entirely fiction-first, with mechanical resolution of moves always flowing from fictional actions and events. In practice, it seems almost impossible to do this with the Spout Lore and Discern Realities moves. Especially Spout Lore. I can see how Discern Realities could naturally follow from a narration such as searching an area, but Spout Lore is really more an improv trigger. Though the rules place the responsibility on the GM, in practice we handled it more collaboratively. Overall it ran smoothly and the procedures seemed easy for the new players to understand. The collaborative world building and bonds could easily be overlaid on D&D for a referee that did not want to spend time in more detailed prep and seems lighter than many other procedural alternatives such as running a game of Microscope. It might be difficult to calibrate hazard clues and difficulty by improv, though I think it would be doable with practice (I have certainly improvised fair but deadly traps in OD&D before). An exploration game could possibly be done by roughly outlining some key spatial and structural relationships and then determining the interstices during play. This would allow a sense of impartiality beyond collaborative interchange (though that is a form of discovery as well). By default, the content included in Dungeon World seems to shift the tone and atmosphere toward D&D style fantasy. Resisting that would require extensive preparation (new classes, new moves, etc), though perhaps still not more than required for building settings and dungeons for traditional D&D. 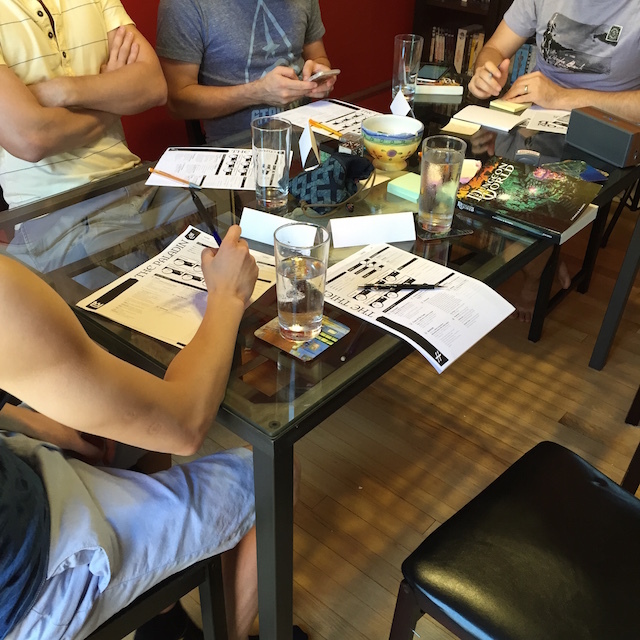 This entry was posted in Uncategorized and tagged Dungeon World on September 30, 2015 by Necropraxis. Back in June, Noisms had several posts about writing quality in RPG texts (initial post and his examples of good RPG writing). I was also curious about this empirically, so I created a survey to see what other people thought. I didn’t define well-written but rather left it to the respondents to interpret as they chose. Don’t consider this a representative sample of anything other than people who follow me on Google Plus (and the followers of the several people that reshared the survey link). The survey asked age, gender, the top five best-written RPG books, the game played most frequently, the game started with, and any general comments about the books chosen. Looking at mentions in all five places, the results move around, but remain largely consistent. Traveller, Deep Carbon Observatory, and Warhammer Fantasy Roleplay surface while Nobilis, Torchbearer, and Vornheim disappear. 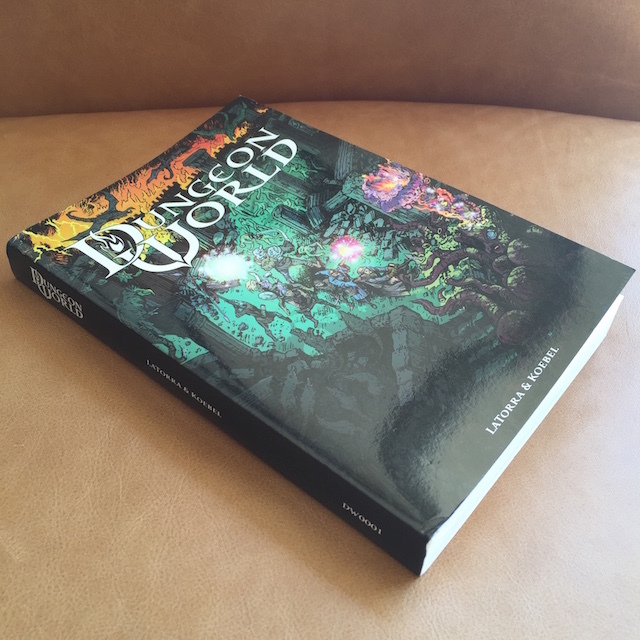 The standout trends seem to be toward high-concept settings or adventures (A Red and Pleasant Land, Yoon-Suin), general but coherent rule sets (Moldvay B/X, DCC RPG, LotFP, Call of Cthulhu), and influential, nostalgic classics (the AD&D DMG, B/X, maybe Call of Cthulhu). 71 respondents left general summary comments explaining their reasoning. Everyone who left a general comment also listed at least one book (and most listed all five). Reading through them, I identified six broad categories of concern: usability, evocativeness, mechanics, coaching, personality, and focus. Usability includes both direct, functional prose and also organization. Utilitarian concerns, basically. Evocativeness is about the aesthetic value of the text and communication of setting. Mechanics prizes elegance, preciseness, or innovativeness in terms of the game procedures. Coaching encompasses pedagogy, explaining how a game is intended to work, and theoretical development such as discussion of game concepts. Personality covers a unique creator vision or strong authorial voice. Finally, focus is concern with and strength of theme, tone, or highly specific intended play experience. Some comments counted in multiple categories. Usability and evocativeness are the clear, high priorities, but were not necessarily shared and could be conflicting (such as with dense or extensive flavor text). Put words to play principles and behavior that I didn’t have words for before. Set tone or setting very well. An abundance of technical information and solid technical writing that prioritises the clarity and accessibility of information over evocative but unplayable flourishes. Ability to entertain while informing, conveying the game information in a genuine and sympathetic authorial voice. Ease of read is not really a factor for me. When I pick up the book, I pick up a manual that needs to teach me how to play the game and those games listed earlier do just that. They are not easy or “good” reads, but they convey the rules in approachable easy to understand manner. They’re all written with clear discussions about what themes the games are exploring and what the mechanics are trying to achieve. Not just, here are some mechs, now go play. They are books vivid in a sense of their world; they are books I re-read for pleasure; they are books I have learned how to be a better writer from reading. Simplicity, clarity, not-up-it’s-own-arse prose, not trying to hard to be different, full of idea springboards. I don’t like many of the rule changes implemented in AD&D 2e, but I have to admit that the core rulebooks are very easy to read and understand, even enjoyable to read. I especially liked the ecologies from the Monstrous Manual. Evocative, dense, treat the reader as an adult with his/her own ideas and thoughts. Reading them makes me want to run them, and makes me think about gaming. Almost everyone started playing with some flavor of D&D. The top ten answers listed (which made up 71 of 91 responses to this question) were all D&D, the top five being Moldvay Basic, AD&D, Holmes Basic, Mentzer Basic, and D&D (version unspecified). Nobody started with Vampire or other White Wolf game, which is the other major system I might expect. This entry was posted in Uncategorized on September 17, 2015 by Necropraxis.